Our company specialises in shower installations, repairs and all technical aspects of shower design and has been operating for over 15 years in the Auckland region. We install and are registered with all the major brands of showers available on the market. 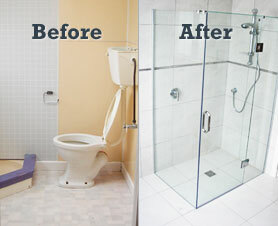 GSI offers a 5 year "Leak Free" Guarantee on our shower installations. Terms of the “Leak Free” Guarantee are dependent on the manufacturing warranty the shower company provides with the shower. Call and chat to our friendly team today to discuss your shower installation requirements.